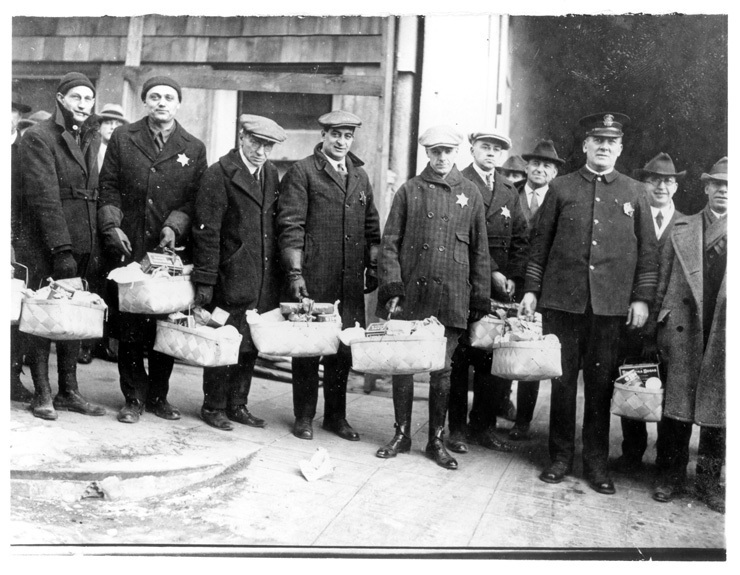 Free Food & Clothing Assistance for 94 Years!Since 1923, the Portland Police Bureau Sunshine Division has been providing food and clothing relief to Portland families and individuals in need. Whether due to the loss of a job, domestic crime, illness, or victims of fire or disaster, the Sunshine Division has built a 94-year legacy of mobilizing quickly and efficiently to assist distressed Portlanders. 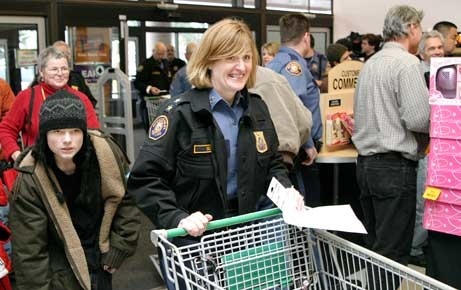 ​The Sunshine Division Food Pantry offers food assistance six days a week at their warehouse and 24 hour food assistance through partnerships with the Portland Police Bureau, who store Sunshine Division food boxes at each police precinct to be dispatched at any time. We also provide no-cost, bulk food and food boxes to 20+ local hunger relief non-profits serving Clark, Clackamas, Washington, and Multnomah counties. Cereal, Canned Fruit, Dry or Canned Beans, Tuna Fish, Rice, Fresh or Frozen Meat, and any Canned Dinners. Want to help? Host your own food or clothing drive at your work, school, or organization.They'll supply you with a donation barrel or barrels, guidance, helpful tips, and promotional material. To start, just tell them when and where you would like a donation barrel delivered. Do you have multiple business or school locations and want each location to compete? Let them know and they'll keep track of each location’s weights. Would you like a staff representative to speak to your group about how your donations are used? Count them in! Questions about or to schedule a food or clothing drive, call 503-823-2119. ​ I had the privilege of volunteering for The Sunshine Division for my 2016 spring semester at Portland State University with the Capstone "Effective Change Agent" class and can say that it was a positive experience. My main focus was in the clothing department which consisted of sorting out donated clothes for useable and nonuseable items, then hanging them according to mens, womens and childrens sizes which would then be added to the clothing store. I enjoyed getting to know other volunteers and really liked the group effort of providing a very helpful service for those experiencing hardships. The whole atmosphere was very inviting and I think it was rewarding being able to do something with my own time that didn't require repayment. I think it's important for everyone to volunteer in some aspect at least once, because it helps people to understand the challenges outside of their own environments. I encountered people that I wanted to help, but couldn't communicate with because they couldn't speak English. It made me wonder if they had just arrived in our country and didn't understand much about the area or the culture. Then there were those that were very grateful for whatever help they were able to recieve that had lived in Portland for a long time. I couldn't help but wonder if each one of them had a place to sleep that night. The fact that they had a temporary bit of assistance to get through a few days made me feel like I was contributing even if only on a small scale. 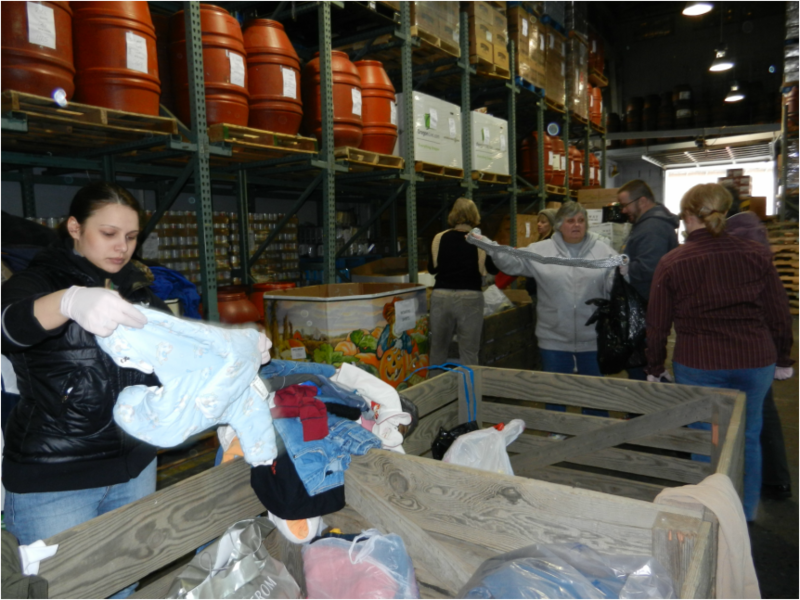 Volunteers sort out donated clothes for the Clothing Store. Shop with a Cop is a program that enables police officers and 200 kids to shop together for back to school clothing. The majority of the children are selected from the Boys and Girls Club of Portland, and are selected based on financial need and their volunteer efforts in the community. These kids have worked very hard to earn this unique opportunity. The Sunshine Division and Fred Meyer jointly fund the program and have generously contributed more than $26,000 towards the event. In addition to the cash donation, Fred Meyer provides significant discounts as well as a backpack with school supplies for every child. 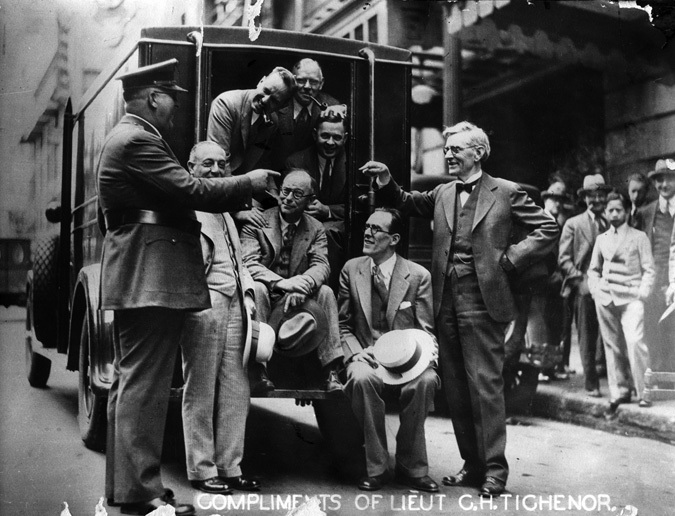 It was 1922, the economy had taken a dip, and the City of Portland had to lay off some 40 police officers. To compensate for this loss, then mayor George Baker gathered volunteer civilians to serve in emergency situations-a group eventually called the Portland Police Reserve. The Reserves found themselves responding to widespread poverty in Portland by collecting food to fill Christmas baskets that were delivered to Portlanders in need. ​They were quickly dubbed “George Baker’s Sunshine Boys,” as they spread sunshine to the households they visited. The early KGW radio variety show “Hoot Owls” took up the cause, devoting a segment-or division-of the program to soliciting donations of food and funds from listeners for the Sunshine Boys. And so was born the “Sunshine Division.” By the time Christmas of 1923 rolled around, the uniformed police, as well as the Police Reserve volunteers were collecting food and delivering it to hungry families. Soon the charity found a home on the second floor of the East Precinct station at SE 7th & Alder. In 1938 it moved into a recently vacated police precinct station at 38 NE Russell Street, then to our current location in 1975. 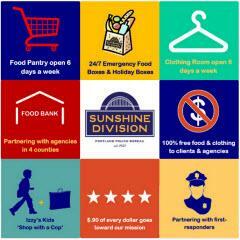 More than nine decades after those early humanitarian efforts by uniformed and volunteer police – and still in a vital partnership with Portland Police Bureau – Sunshine Division continues its fundamental mission: to provide emergency food and clothing relief year-round to Portland families and individuals in need. During the life of Sunshine Division, we’ve grown into a 501(c)(3) nonprofit agency that relies solely on donations to fund the collection and distribution of food and clothes. Through our front doors we serve 15,600+ households a year with “shopping” experiences in our clothing store as well as with food (including nonperishable, frozen, fresh produce, and dairy products). We also make bulk donations of food to 15+ other food-relief agencies in five counties, thus extending our reach beyond the City of Portland. On any given night, about 4,000 people sleep on the streets or in shelters across Portland. Homeless people can be adults, young people, couples or families with children. They are living on the streets, either temporarily or for the long term, for a variety of reasons. They may be homeless because of an untreated mental illness, a physical disability, domestic violence, the loss of a job, or a drug addiction. They may be experiencing a financial crisis and have been evicted from their home for the first time; they may cycle from homelessness to housing and back to homelessness again; or they may be chronically homeless, having lived on the streets for many months or years. The City of Portland and Multnomah County invest public funds and operate programs that provide direct services to homeless people and families. The City and County also fund services provided by nonprofit organizations and private service agencies. Corrections facilities, hospitals, schools, churches, and charities also provide assistance to homeless people. All are partners in the “homeless system” and have a direct stake in providing effective and efficient services with a goal to end homelessness. The wider community also has a stake in ending homelessness. As members of a community, we want to take care of our citizens, including those with illnesses or disabilities who cannot care for themselves. In addition, all of us want safe, clean and livable streets and neighborhoods. We believe that rather than shuffling homeless people from service to service and back to the street, the aim of our efforts must be to first get homeless people into permanent housing. This requires that all partners in the homeless system work together in innovative and more accountable ways. Much of the Portland Housing Bureau's work around homelessness is driven by our community's plan to end homelessness. View the full plan here, or use the links at left and below to explore our programs and services, and find related data.